Last winter featured a highly dominant pattern of lower pressures in the Arctic and higher pressures in the mid-latitudes, especially the United States. This was a classic +AO/NAO regime in which the strong jet stream precluded the amplification of cold troughs into any part of the US. 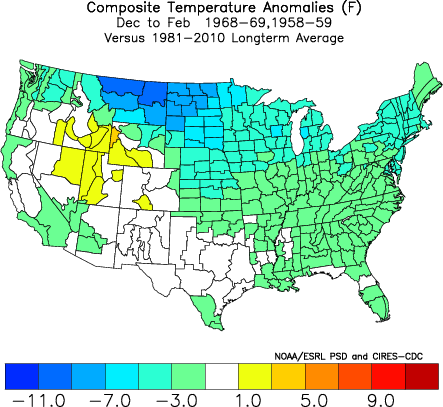 As a result, the November-April period of 2011-12 was one of the warmest and least snowy on record for the lower 48 States. This winter, since the outlook is being issued a month later than last year, I hope to avoid unforeseen patterns with November’s data helping to strengthen statistical and physical correlation for the December-January-February (DJF) meteorological winter season. Factors that will be considered, but not limited to: ENSO, PDO, PNA, NAO, AO, EPO, Solar activity / trends, Stratospheric activity / trends, QBO, forecast modeling, pattern persistence and analogs (years with patterns similar to the present, rolled forward into the future to aid in long term projections). Keep in mind that we are still in the “pioneering” phase with some aspects of long range forecasting, and thus, one cannot attribute the same expectations as one would for a short or medium range forecast (1 month or less). Furthermore, do not expect the level of detail that is provided in short or medium forecasts to appear in long range outlooks. The hope is that the data we collect from the autumn season will aid in forming a general picture of the temperature and precipitation patterns of the future. These data take the form of numerous statistical correlations concerning teleconnection indices, as well as perceived physical forcing mechanisms in both the atmosphere and stratosphere. The El Nino Southern Oscillation (ENSO) index should be in a predominately warm-neutral phase for this winter season, meaning, region 3.4 sea surface temperature anomalies (SSTA) in the central tropical pacific will be in the 0.0c to +0.5c range. Support for this includes predominately positive SOI values, indicative of a tropical Pacific pressure pattern that does not favor the eastward propagation of warmer water. Easterly tropical trades will continue in the tropical Pacific as regions 1-2 continue to run near neutral. Some of this cooler water could move westward, but the central ENSO regions should remain warm-neutral for the winter season. Forecast guidance, including statistical/dynamical models as well as ECMWF models support the idea of a region 3.4 trimonthly peak around +0.4c. The Pacific Decadal Oscillation (PDO) is a measure of SSTA to the north of the tropics in the Pacific Ocean. A positive PDO generally means warmer water in the Gulf of Alaska, southward along the Western US coast, while a negative PDO indicates the presence of colder than normal waters in that same region. The PDO has been strongly negative this fall, although we saw a relaxation in October. Over the past few weeks, waters have cooled somewhat again, and thus PDO values should be around -1 or more negative heading into December. Statistics suggest that most autumns with strongly negative PDO’s have at least a moderate negative PDO for the DJF season. Thus, I have high confidence that the PDO will be negative, and ENSO will be warm neutral the next few months. The Pacific North American Index (PNA) is highly correlated to PDO values, though it can veer off sometimes. Usually when the PDO is negative, the PNA is negative, and vice versa. 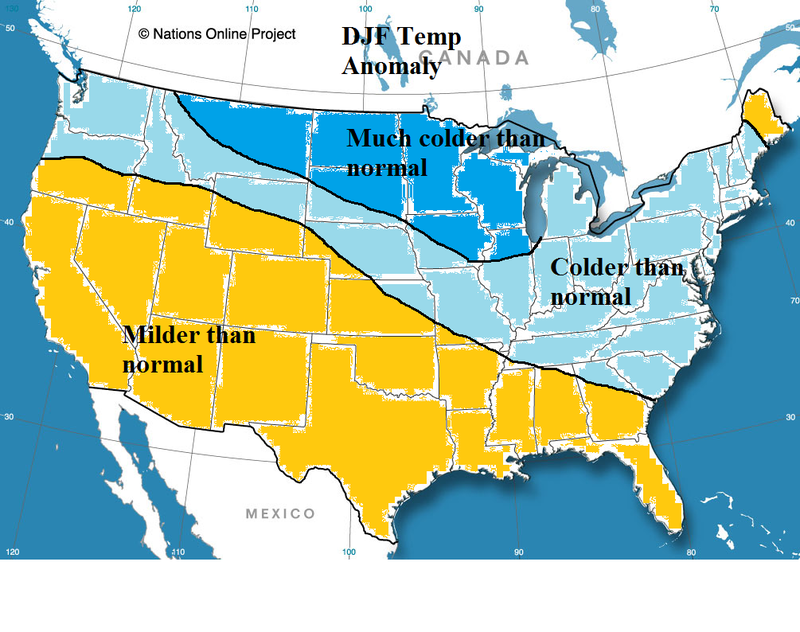 A –PNA pattern favors Western US cold, while a +PNA favors Eastern cold, though other indices can mute or bolster the PNA signaling. In other words – there is a strong positive correlation from Nov to DJF and (stronger) Dec to DJF. If the PNA is negative in November, there’s a tendency for a negative PNA winter, and vice versa. If the PNA is negative in December, there’s a very strong likelihood the DJF PNA will average negative. The Pacific jet was strong, and the blocking didn’t matter, as mild air flood the nation from west to east. If we see a pattern similar to this on models – sound the alarm bells. 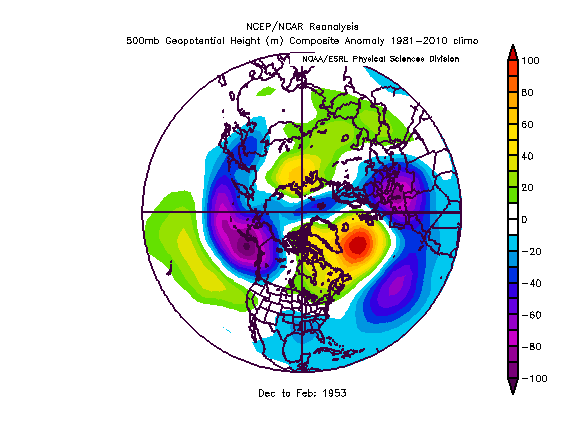 However, the EPO in November 1952 was positive, which correlated nicely to the positive EPO winter. The EPO this November was negative, which should mean a negative EPO winter. The two closest analogs I could find in terms of most of the factors explained are 1958-59 and 1968-69. Not everything is the same, but quite a bit of similarities. Those winters were very cold ones across most of the USA, with some warmth in the West. Another factor not mentioned yet – global atmospheric angular momentum (GLAAM) has surged positive in recent weeks. Since 1950, a negative GLAAM has correlated to more Nina like atmospheric regimes while positive GLAAM has correlated to more Nino like atmospheric regimes. Additionally, winters with a +GLAAM tended to have more moisture, including 57-58, 60-61, 63-64, 66-67, 76-77, 77-78, 86-87, 95-96, 02-03, 04-05, and 09-10, while winters with –GLAAM tended to have less moisture, and thus less snowfall, in the Northeast corridor, like 61-62, 62-63, 64-65, 67-68, 58-59, etc. Virtually all of the years noted were cold ones in the Northeast, but the snowfall was more variable (some snowy some not so snowy). Given the recent surge in GLAAM values, there is reason to believe the pattern of coastal storms we’ve seen in November could very well occur in the ensuing cold season. I am not expecting a blockbuster snow year in the Northeast corridor, but it is likely that normal values will be reached, and very possible that above normal snowfall will occur. 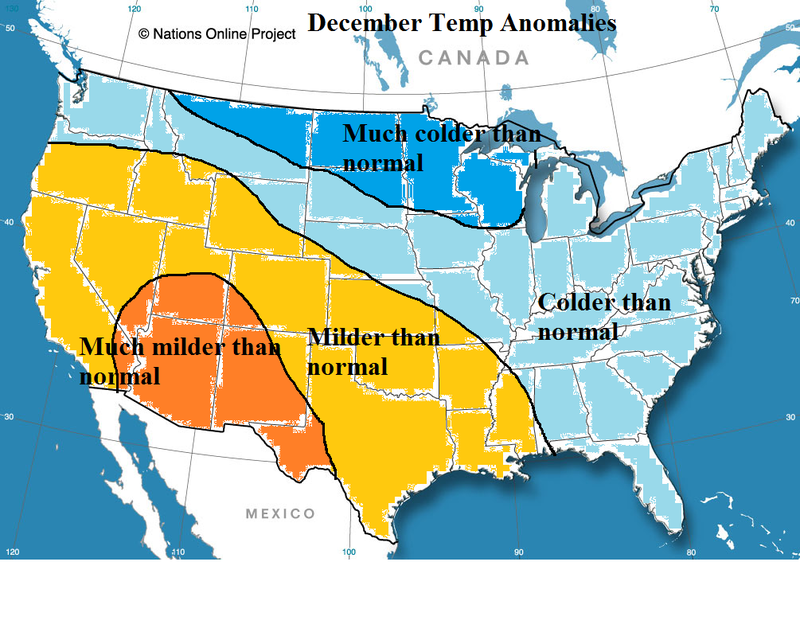 December should start warmer than normal across much of the USA as ridging expands from west to east. The NAO and AO will become increasingly negative in early December, although a brief burst of positive of EPO will yield a warmer than normal temp regime for the Eastern US. However, by the second week of December, Alaskan ridging and polar blocking should result in a re-shuffling in the global regime, and the mean trough should position itself in the Mid-west and Northeast US. 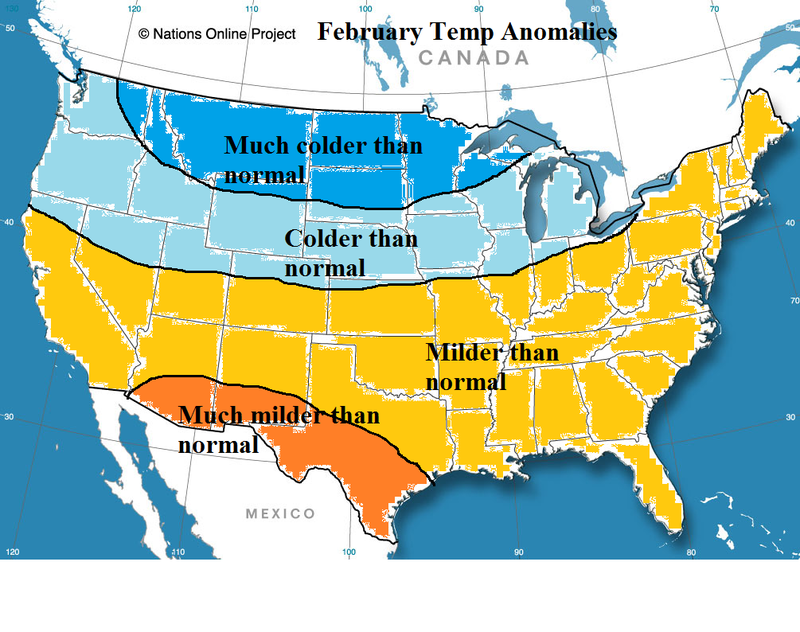 The month overall will be much colder than normal in the northern plains and colder than normal in the Northeast, as weeks 2-4 outweigh the warmth of weeks 1-2 in the Northeast. A stratospheric warming event may develop in mid December, leading to maintenance of blocking during the month of January. 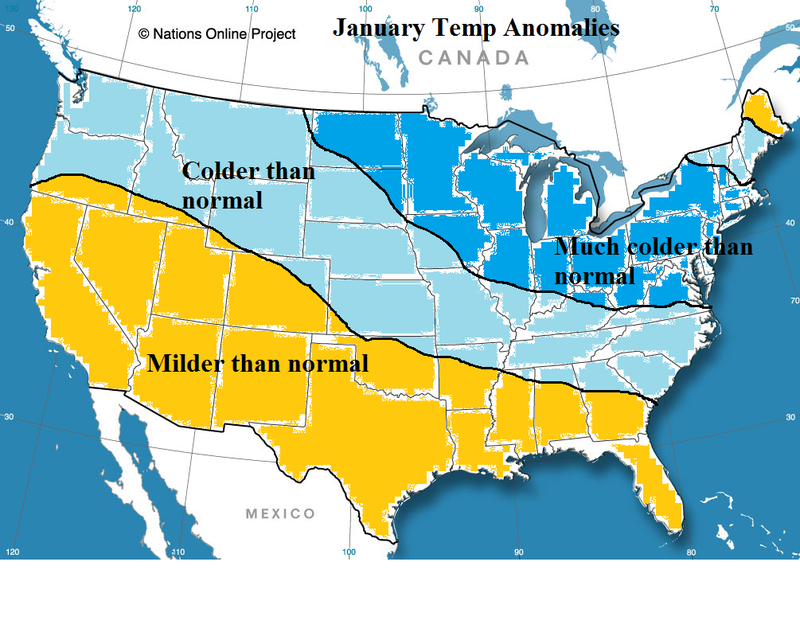 In fact, I expect Dec-Jan to produce the bulk of the cold temp anomalies in the Northeast. February, the negative NAO/AO may neutralize with a more Nina-like pattern developing, as colder than normal temps dominate the PAC NW and Plains, with near to slightly above normal temps on the East Coast. This is not a classic El Nino temp pattern. ENSO will be weakening by later winter, and given my expectations with NAO/AO and blocking timing, the Dec/Jan period should be colder than February, although I don’t believe February will torch. Overall, a very cold winter is on tap for much of the northern tier of the USA, down to the SE US coast. The SW US and southern Plains should be mild. Precipitation should increase compared to November’s precip anomalies, but I expect a below avg precip winter in the Northeast. However, there will be bursts of increased Sub tropical energy, resulting in several coastal storm opportunities. I anticipate below normal snowfall in Northern New England, with their snowiest month being February (the mildest month wrt normal) and near or above normal snowfall for Southern half of New England and the mid atlantic.